You don’t need to spend a lot of eggs to create beautiful style that will transform your home into a fresh and festive springtime setting. Try one or two of these ideas to enrich your space as you enjoy the treasures of the season. 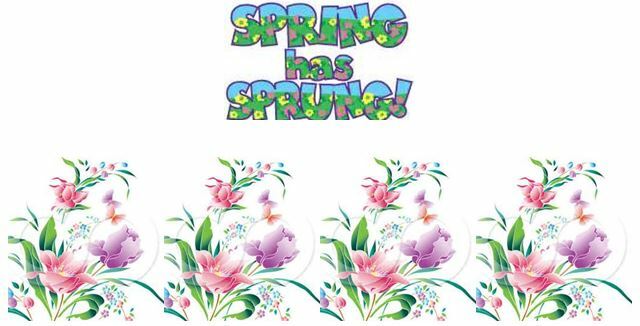 Keep in mind spring is all about new. Bright new colors, sharp new textures and a crisp new you! Mix and match, up-style what you already have and let your creative side shine as you bask in the promise of new life. Decoration today dinner tomorrow! Go au naturel and use nature’s wonders as springtime pretties. From apples to leafy greens, produce makes beautiful table decorations. Fill a vase with citrus or apples. Tie asparagus up in a pretty bow. Slice lemons and limes to allow the rich flesh to shine through a clear vase, or present strawberries with flowers and Jelly Beans! Look for items that can withstand a day or two on the table and you can use today’s designs in tomorrow’s menu. Buy weekly specials and save! Look for what’s on sale in the produce department and plan your designs around market discounts. Lemons to Blood Oranges, Key Limes to tangerines work great to add spring freshness and rich style to your seasonal floral fantasy. they already complement, go for a stand out color in linens or flowers to ignite the style. If nothing matches simply run a single color of ribbon or flowers throughout to tie it all together. This spring, trade in traditional for titillating! Easter sweets as table treats. It’s amazing what you can do with a bag of candy! Use seasonal candy to make a colorful statement all throughout spring. M&Ms, Jelly Beans, Robins Eggs, and PEEPS make fun-tastic vase fillers! Start with an empty vase, add a glass jar to the center, (this will be what you fill with water to hold your flowers). Build your candy design around the glass in the center. Fill the center glass with water and add flowers. Nestle bunnies right on top of mini eggs or tie candy bars with a pretty bow and fill with treats. Use up that leftover candy as decoration and you’ll have a creative centerpiece that will keep you from eating-up all those calories. Don’t overlook those low cost bargains! It’s easy to transform inexpensive items into beautiful high style. Fill little pales with Easter grass and eggs, or insert plants and apply a sticker. For pretty table runners use springtime ribbon or inexpensive fabric. No need to hem and sow, simply fold under the edges and place dishes right on top to secure. Fill colorful bottles with a single stem or hang an assortment of lanterns and crepe paper fans right over the table. Combine and group, mix and mingle and you’ll have classic style for very little dough! 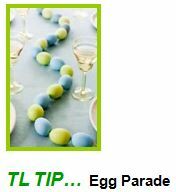 Use all those colored eggs as your table runner! Simply line them up right down the center of your table or twist and turn the line into a beautiful design. For fast and affordable alternatives to coloring eggs use crafting supplies you have on hand. Bedazzle eggs with scrap booking materials, apply fancy stickers, tie up in a pretty bow or simply draw designs with colorful markers. Set the table with an assortment of pretty pieces and let the kids get creeggtive!